When our course opens we find David standing at the peak of his reign. He has conquered territory,created an empire, established a capital city, and is supported by both God and a united nation. David remains on these heights only a short time, and our course will watch a king lose his footing. One fatal mistake will slowly unwind the surety of David’s standing among the people, among his own family, and with God. Yet David will never lose the kingship. How does David use teshuva, repentance, to move forward despite failures and setbacks? 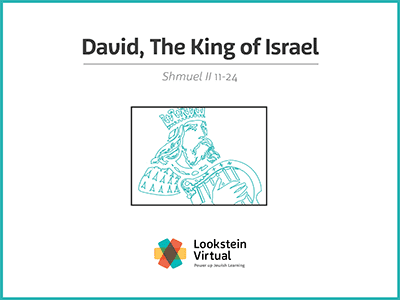 By the end of the book of Shmuel and the end of our course, we will find a king who, while standing in his great imperfection, will be ensured the continuity of his dynasty and a place as the greatest model of kingship the Israelite nation will ever know.